A multitude of books will no doubt be published this year commemorating the outbreak of World War I, many of them novels adding to the already substantial body of fiction devoted to it including Pat Barker’s Regeneration trilogy, Sebastian Faulks’ Birdsong, Louisa Young’s My Dear, I Wanted to Tell You and Erich Maria Remarque’s All Quiet on the Western Front, to name but a few. Stiff competition, then. 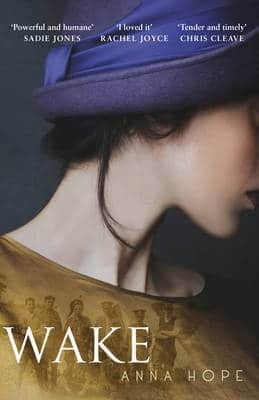 Three 2014 novels have caught my eye, one of which is Anna Hope’s debut Wake, partly because it explores women’s experience of the war and its aftermath, partly because of its unusual premise. Set in 1920 it covers five days in which the body of the Unknown Soldier is chosen, prepared for burial, transported from the battlefields of France and given a state funeral on what will come to be known as Remembrance day. Wake follows three disparate women over the course of those five days – Hettie, a ‘dance instructress’ at the Hammersmith Palais charging sixpence a dance; Evelyn, from a well-connected family, who works in the war pensions office; and Ada, a housewife who has lost her son. Hettie’s brother is shell-shocked, unable to look for work, haunted by nightmares. Evelyn’s brother, a captain returned from the Front, spends much of his time drunk while she misses her lost lover, judging the veterans forced to plead their case before they even open their mouths. Ada and Jack no longer talk about their son but Ada cannot accept his death nor understand why she has never learnt the details of that death the way that other mothers have. Threaded through their stories is the progress of the Unknown Soldier as he nears the end of his journey, bringing the country together in what is hoped will be a cathartic act of communal grief and a commemoration of sacrifice. Apparently, Hope had the idea of writing Wake while researching women’s social history and the suffrage movement so it’s worth noting that, shocking as it may seem, despite the fact that many women contributed to the war effort – Evelyn works in a munitions factory, for instance – most would not gain the vote until 1928, a decade after the war ended. Seems scarcely believable now, but it’s all too true. This entry was posted in Reviews and tagged Anna Hope, Doubleday, First World War Fiction, Wake on 17 January 2014 by Susan Osborne. I’m not sure I knew that there is an actual body if a soldier burried in the Unknown Soldier’s grave. I think I thought it was more of an honorary or metaphorical thing. Interesting. Is it known who he was? Sounds like an interesting book. Maybe I should get around to reading Pat Barker’s trilogi this year. No, it seems he really was unknown. In the novel Hope suggests that it is, as you say, a symbolic gesture aimed at those who had lost someone but had no body to bury which must have been particularly hard to bear. I wonder how it was actually thought of at the time. I was tempted by this at first and then discouraged by some of the early reviews with regard to the style of writing. Do you have any comment on the way it was written or was the plot sufficiently enticing to pull you along? That’s interesting. I’ll have to look them up – I tend to avoid other people’s reviews before I’ve written my own. For me, it was about the story and it’s angle rather than the writing. I had a few minor quibbles but not enough to detract from the novel’s overall effect. I generally look at a few reviews before deciding to request or purchase a book and in this case I decided not to get it. Once I have a book, like you, I forget about reviews and come to it with an open mind. I’m trying to be more discerning this year as I don’t want to get bogged down with too many books, and rather than acquire on a blurb impulse, I’m trying to be more sure in my choices. However, this one did appeal regarding the story. That is a wise resolution. It’s very easy to get caught out by a well written blurb. I hope I haven’t put you in a quandry.